Glenn and Marla confer with Steven at the cemetery the evening before work begins. Photo © 2016 Jay Osborn. 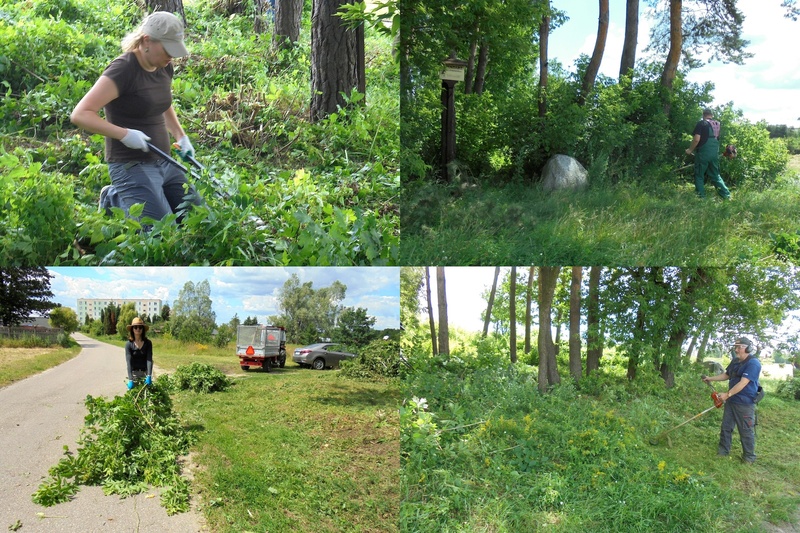 Continuing our volunteer work to gain skills and knowledge in cemetery care, this week Marla and I participated in a Jewish cemetery clearing and cleaning project in Poland conducted by The Matzevah Foundation; although we have helped in several cemetery projects in the past, this was an opportunity to learn about the tools and methods used in larger-scale grounds work, in a grounds scenario similar to that in Rohatyn’s two Jewish cemeteries. Our challenge (and note, Steven is a tall man). This project lasted three days at the Jewish cemetery in Nasielsk, Poland, about an hour’s drive north of Warsaw. The work was a cooperative effort by The Matzevah Foundation (TMF, who organized the site work), the Foundation for the Preservation of Jewish Heritage in Poland (FODZ, the owner of the cemetery, and Marla’s employer in Warsaw), the City of Nasielsk, and a Nasielsk Jewish descendants’ group led by Glenn Kurtz and Michael Valihora, which funded much of the project work. Glenn is the author of the Nasielsk-centered book Three Minutes in Poland about a short vacation film made by his grandfather in the town in 1938 and his search for the identity of the many Jewish people it features. A “before” panorama of the southwest corner of the cemetery. Photo © 2016 Jay Osborn. Volunteers from Nasielsk, the surrounding region, and abroad. Photos © 2016 Jay Osborn. We were among more than a dozen volunteers including local citizens, a Nasielsk Jewish descendant from Canada, other interested Poles from the area, Polish descendants of Nasielsk from abroad, and a Warsaw family who are descendants of Helena Jagodzińska, a Polish woman recently granted Righteous Among the Nations status by Yad Vashem for her role in helping a Jewish boy from Nasielsk to hide and survive the war. The City of Nasielsk contributed two experienced groundskeepers plus practical items such as trash bags, waste vegetation collection, a portable toilet, etc. ; the vice mayor and the city secretary both helped to clear the site of debris on the third day. Volunteers of The Matzevah Foundation show us how it’s done. Photos © 2016 Jay Osborn. The Matzevah Foundation is a US-based non-profit organization which for more than five years has been leading Jewish cemetery restoration projects in Poland, in cooperation with the Rabbinic Council for Matters of Jewish Cemeteries in Poland, the Jewish Council of Warsaw, Poland’s Chief Rabbi Michael Schudrich, and FODZ. TMF works with Baptist churches, other like-minded churches, and Jewish organizations to organize volunteer trips to care for and restore Jewish cemeteries in places where there is no longer a Jewish community, or the community is too small or aged to care for the cemeteries. The key goals of TMF are remembrance, restoration, and reconciliation, especially among the Christian and Jewish communities of local residents and descendants. This week’s project was organized by TMF’s founder and CEO Steven D. Reece, and supported by their experienced Poland-based advisers Przemek Panasiuk and Susan Carson. 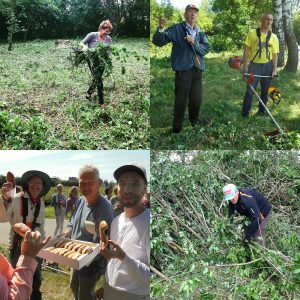 This event was only one of six such projects TMF has organized for 2016; in past years, TMF has conducted a variety of projects in Jewish cemeteries in Krzepice, Oświęcim, Zambrów, and Wolbrom, and some of those projects are ongoing. 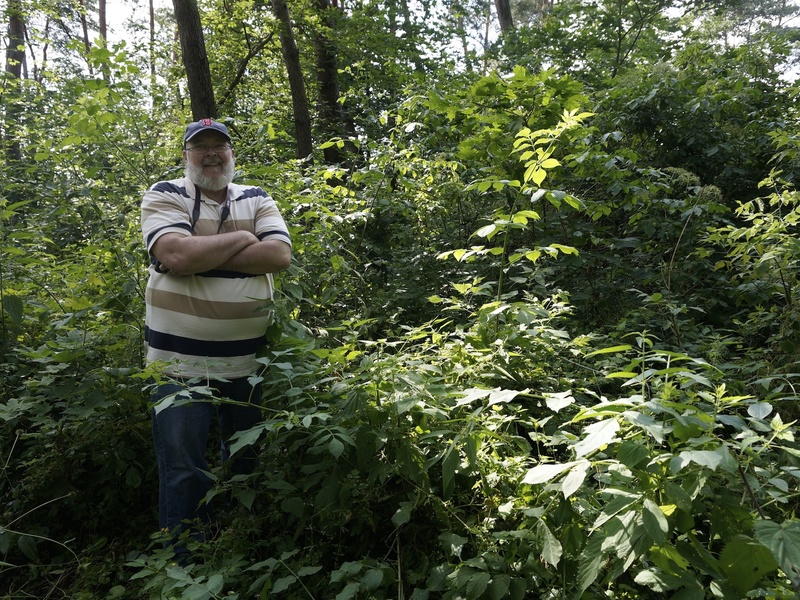 North American descendants of Nasielsk Jewish families, working side by side in the thicket. The Nasielsk Jewish cemetery is east of the town center; it measures approximately 100m wide by 175m deep (roughly 1.75 hectares). It is also very overgrown; among large trees aged at least 50 years, there are many smaller/younger trees, plus large wild shrubs, vines, and low bushes. Much of the vegetation has formed into thickets which are impenetrable without cutting tools, and stinging nettle abounds. 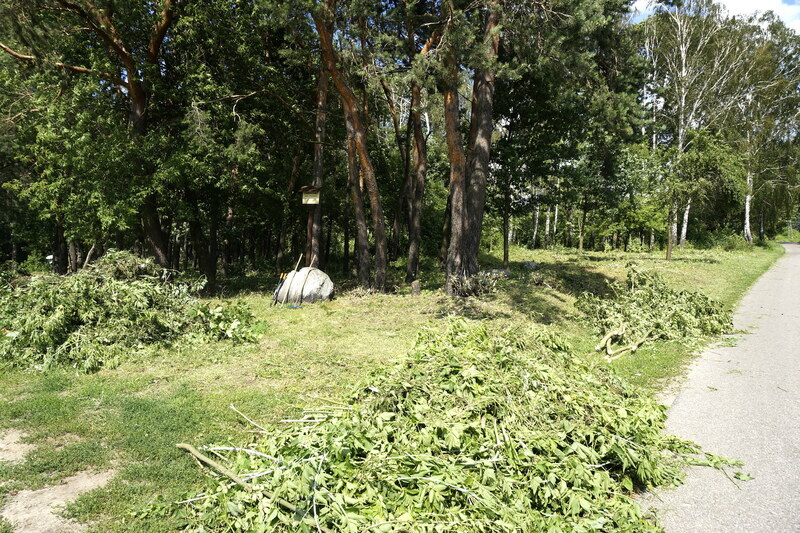 TMF views the Nasielsk cemetery as a multi-year project; this year’s goal was to fully clear around the large trees across the entire width of the cemetery to a depth of about 50m (just over 25% of the total area). There are no known surviving matzevot apart from one small fragment standing loose at a front corner of the cemetery. An early progress snapshot at the southwest corner. Photo © 2016 Jay Osborn. 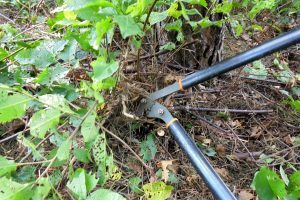 The work was heavy, requiring considerable stamina, the use of large motorized cutting tools, and constant dragging of fallen branches and large stems plus raking of smaller plants as they were cut. 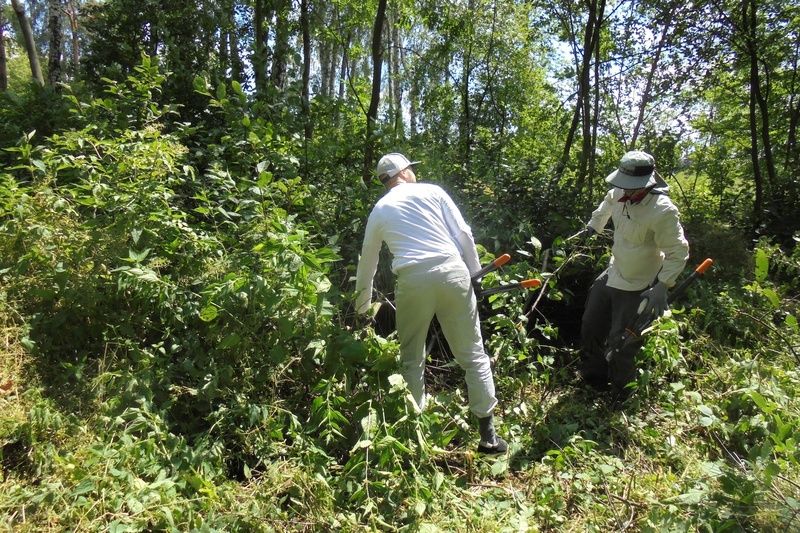 The work was organized by TMF to proceed efficiently with the available tools and labor; typically one or two “draggers” were needed for each “cutter”, to keep the front of the thicket clear for access by the cutting tools. 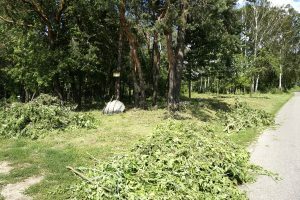 The objective was to remove all of the smaller vegetation down to near ground level, to retard the return of fast-growing shrubs and to simplify future cemetery maintenance with herbicides. An “in progress” panorama of the southwest corner of the cemetery. Photo © 2016 Jay Osborn. Using a lopper to cut close to the ground. Steven and FODZ representatives had visited the cemetery to document its condition and outline a work plan months before the project began. 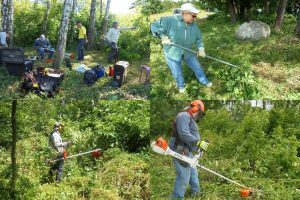 Once onsite, experienced volunteers handled the motorized cutters while the rest of us used long-handled bypass loppers and occasionally an axe to trim smaller branches, plus rakes and our hands to collect and pile the cut vegetation at the edge of the cemetery for later collection. 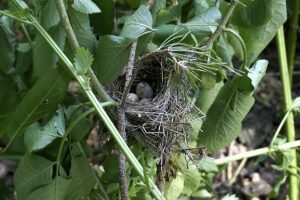 The group was careful not to disturb this nest. 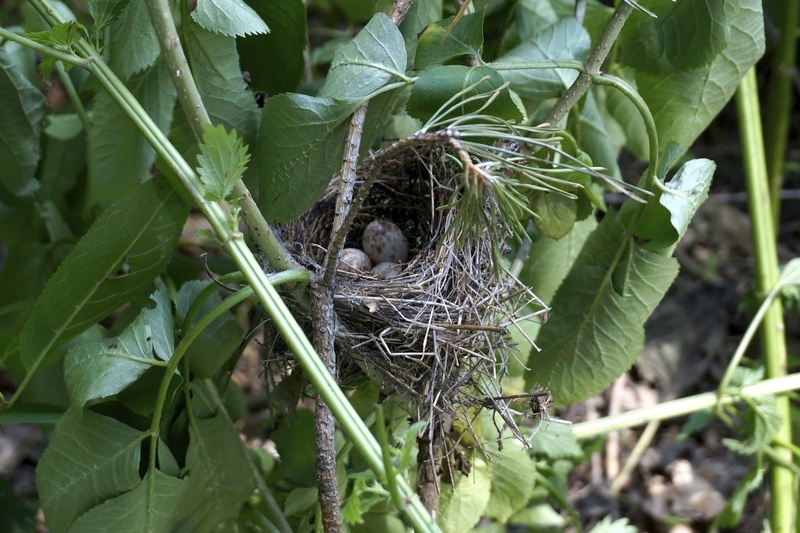 Care was taken to minimize disturbance to the cemetery’s resident fauna; volunteers noticed and preserved a small bird’s nest and a frog’s wet burrow, and we waited to let a snake and several lizards escape the cutting. Enough fallen and dead vegetation was left to decay and support life in the soil. Nasielsk city officials join us in the work… and bring pastries! Photos © 2016 Steven D. Reece and © 2016 Jay Osborn. The social aspect of this work is a significant part of its ongoing value. 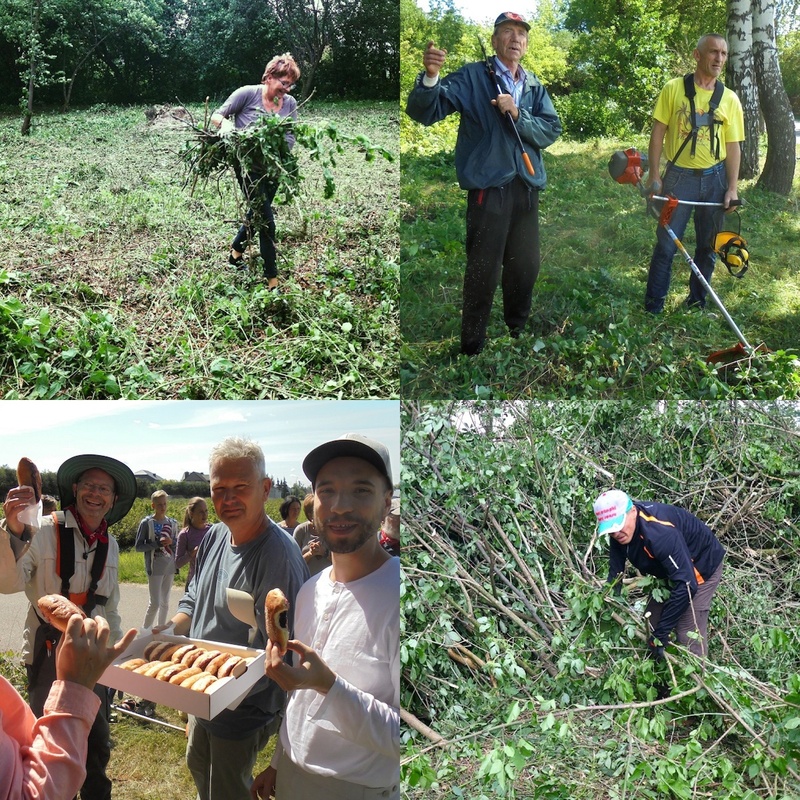 As one of the volunteers noted, the international and interfaith volunteer crew working together with local leaders inspired curiosity and good will in the local community and sparked many impromptu encounters at the cemetery on shared history and heritage. This is a model we have seen work in many places, and is promoted by Dr. Jonathan Webber and others in the European Jewish heritage community as Jewish cultural diplomacy. We were very fortunate in the advance work done by Glenn Kurtz and the descendant Jewish organization to recover a significant portion of the nearly-lost Jewish history of Nasielsk, with the cooperative research and documentation by energetic local historians in town. And we were brought fresh blueberry pastries in the morning by the city’s vice mayor and staff! Marla and I joined the project for the first two days. The photos in this report are a small fraction of what I took during our work with the other volunteers. I will assemble those and my notes to provide a reference on this website for groundskeeping in the Rohatyn Jewish cemeteries, and will supplement the TMF methods with guidelines from other sources, including what Marla and I learn during another cemetery cleaning with a different crew planned for August in Chernivtsi, Ukraine. Sometime thereafter we also hope to join hands with TMF in one of the cemeteries in Rohatyn; Steven and the TMF board are interested to help, so it’s up to us to make the work timely and fitting with our overall cemetery rehabilitation plans. 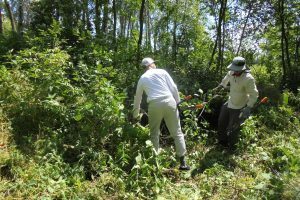 Many hands steadily remove the undergrowth. Photo © 2016 Jay Osborn. Part of the team at the end of Day 2. This work sounds simple but isn’t, and even the most experienced volunteers had to adapt to the site conditions. We could only learn a portion of what we need for Rohatyn in the two days at one site with the TMF project, but it was a very good beginning. We are grateful for the opportunity and for the patience of the TMF team with our questions and inefficiency. The work TMF does is important and meaningful in more than just groundskeeping, and they are working where no one else does. How to donate and/or volunteer to support their work is described on their Get Involved page. 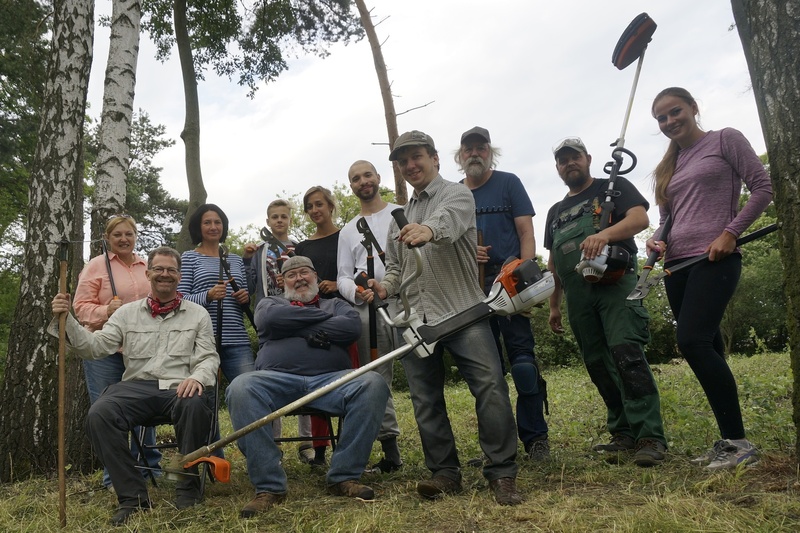 We are very happy to give thanks to Steven, Przemek, Susan, Glenn, Charlie, Tomasz, Kasia, Jerzy, Stanisław, Monika, Paulina, Martyna, Adam, Katarzyna, Krzysztof, Marek, to the local residents, to the advance team of Monika, Marcin, Marek, and Michael, and to the City of Nasielsk, for their energy and their heart in this helpful and fulfilling experience. An “after” panorama in 300° of the front of the cemetery, taken from the central path.